These two Revia Lab products are wonderful to add to your skin care routine. 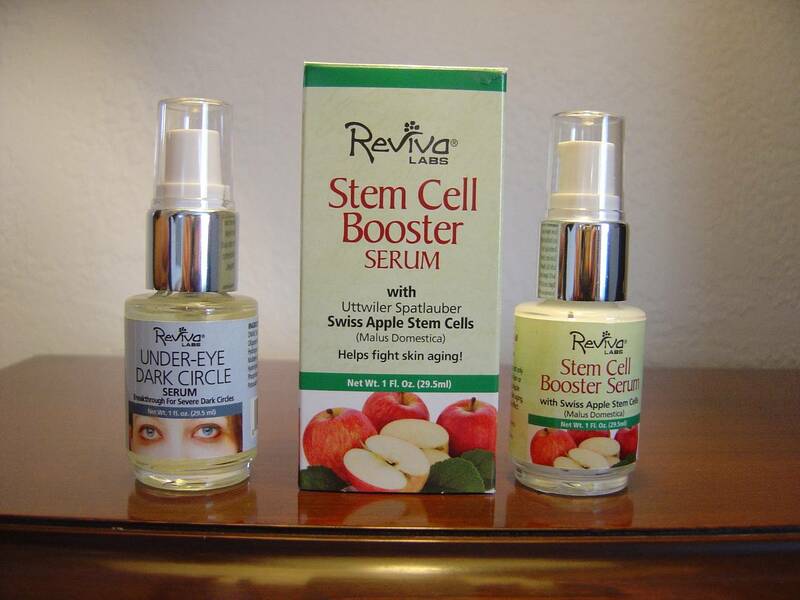 You can either learn to use cosmetics like a makeup artist to beautify or be lucky enough to run into skin care products that can help eradicate problems instead of merely masking them up like the two of the excellent items sent to me from the natural skin care experts at Reviva Labs for this review and giveaway with their Under Eye Dark Circle Serum and Swiss Apple Stem Cell Booster Serum. As one that suffers from year round allergies, I constantly battle dark under eye circles known as allergic shiners on a daily basis with puffiness. Unlike some that wake up beautiful, I do not even look at my reflection while I wash until I have my first cup of coffee so that my eyes have a chance to drain somehow. Otherwise, it spoils my breakfast. When I applied a dab of the Under Eye Dark Circle Serum and tapped the substance gently beneath my eyes the following morning, I didn’t expect the puffiness would go down that quickly. However, I began noticing changes about an hour later with the darkness lighting along with those saucer eyes. Nonetheless, the reason could be attributed to the biopeptide/bioflavanoid complex Reviva Labs uses in the formula. The ingredient helps eliminate the darkening problem from hemoglobin deposits accumulating under the eyes from capillary leakage besides working on the puffiness. Since I heard about the exciting effects on skin from apple stem cells for repairing the aging process, I was more than happy to volunteer my face for experimentation with the Swiss Apple Stem Cell Booster Serum. You can use this product either alone or under your day moisturizer, night cream, or serum, which the company encourages for even better results since it acts as a catalyst. Layering this Reviva Labs serum with the anti-aging serum I was currently using did help further beautify my complexion. The more I keep using this product with my anti-aging serum, the more radiant and flawless my skin is looking. My already smooth skin is even softer. Also, I noticed even my pores seem to be hardly visible. Both of these products are great if you want my opinion. In fact, I am eager to try more from Reviva Labs and think you should give them a try. Thanks to Reviva Labs, one lucky Nuts 4 Stuff reader in the United States wins an Under Eye Dark Circle Serum (1 fl. oz.) and a Swiss Apple Stem Cell Booster Serum (1 fl. oz) for a total of $59! 2. Go to Reviva Labs and tell me what other product you also would love to try or something else you learned from their website in another comment. Leave a separate comment for each entry. Please include your email address inside your comment so I can contact you if you win! This giveaway is only open to residents of the United States. Do follow the rules because I check entries. Be alert that if you attempt to enter using multiple identities will be grounds for disqualification. This giveaway ends January 16, 2012 at 12 PM Eastern Standard Time. The winner will need to respond to my email with name and shipping address within 48-hours or another winner will be picked. i would love to tr the vitamin e oil stick w/spf 15. I'd like to try DMAE Firming Fluid for my aging skin. I'd also like to try the DMAE Firming Fluid! I also entered Skin Pro's New Elite Serum Giveaway! GFC follower Sarah learned that there is a vitamin P which helps with rosacea and spider veins. I love that it's animal cruelty free! GFC follower: Jennifer R I think the Seaweed Soap All Vegetable 4.5 oz Bar from their site looks intriguing as well. I would like to try it. GFC follower: Atreau.I would love to try the Seaweed Soap All Vegetable 4.5 oz Bar. I learned that the company is located in Haddonfield, New Jersey. I tweeted about this giveaway on Twitter at https://twitter.com/#!/likwan/status/158955392901189634.